It’s always a strange feeling when Thanksgiving is so early; November 22 is actually the earliest that Thanksgiving can occur. It is hard to get right into the holiday mood when there is more than a week of November remaining. To me, November is defined by the color orange. It is the color of the fall leaves, the color of pumpkins, the color of the harvest, the color of a crackling fire in the hearth. I am not quite ready for all of the green and red (although I do try to minimize the red, my least favorite color, and go with more of the green and white where possible), so I thought I would pull a few images of one of my favorite colors of flower – orange. I have had accents of orange in my décor for over 15 years, and still have a bit of the tone in my library. Whenever I see an elegant orange toned flower, I often buy a bouquet and place it on the coffee table in my library. Here is some more orange flower inspiration, before we say goodbye to the month of November and bring on the colors of the holidays! Orange flowers, via pinterest. I am partial to tulips and roses, although the beautiful tight spiral of the ranunculus is quite pretty. Clever idea for a dramatic floral display – group together many vases for a dramatic centerpiece. I came across this image via Barbara Heath of the Mercantile. 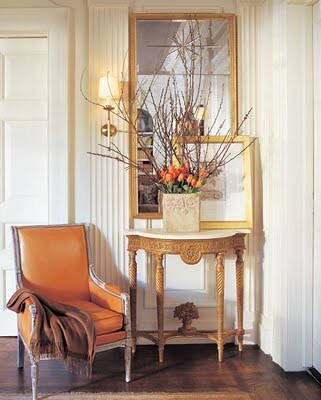 I love how the color of the chair was pulled into the flower arrangement in this lovely vignette. 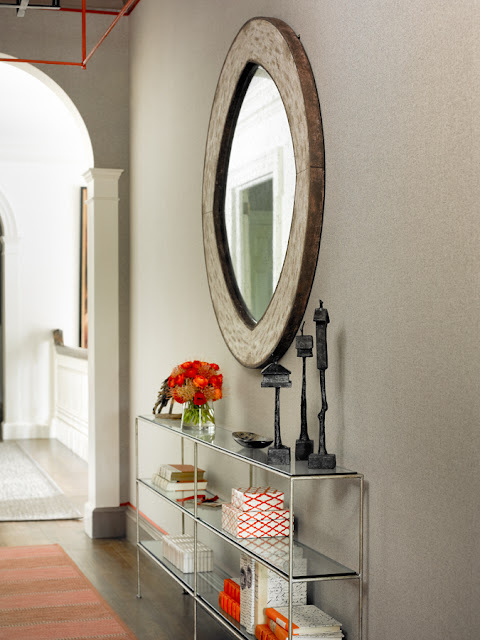 This vignette, with design by the talented Atlanta based firm The Design Atelier, is like a work of art, and I particularly like the accents of orange that are carried through to the vibrant orange bouquet. The Design Atelier has a wonderful new blog, which can be seen here. One of my favorite pinterest finds over the past month! Perhaps my favorite image from the book Inspired Interiors (one of my favorite décor books), by Suzanne Kasler. This book was on my 2011 favorite book list, and can be seen on Amazon here. Orange peonies charmingly displayed in a jelly jar, via pinterest. An old Suzanne Kasler image. I love how the daisies pick up the color from the chair stripes. A friend of mine, who used Suzanne for his house décor, now owns these chairs! The little pop of orange from the bouquet makes this painting sing. Available here. I wish pinterest had been around when I planned my wedding! So many gorgeous ideas, including a treasure trove of orange flower pictures. I am not sure if these are flowers, but they make a striking arrangement. Another beautiful orange themed table setting via pinterest. Orange tulips are my favorite. Although this is clearly for a party, the arrangement itself would be easy to replicate at home. Small accents of orange highlight this lovely office, including a small bouquet of gerber daisies. Is that a picture of Prince William and Kate Middleton on the desk? Décor by Scout for the Home. When I saw these roses at Costco, I thought the deep orange color would look beautiful in my library. Little did I know that they would match the books so well! I always get orange toned flowers for this room, as the color provides a nice pop against the soothing gray of the floors and walls. Two of the books on my coffee table are among my favorites – and they both have the same beautiful shade of vivid orange (vermillion perhaps) that I love so much. Mark Rothko: the Works on Canvas was a treasured Christmas gift a few years ago, and is a continuous source of inspiration. Click here to see on Amazon. The book Trout: an Illustrated History is perhaps the most commented about book in my house – people seem to be surprised that I own a book about trout - but it is an incredible book full of the most beautiful illustrations. Click here to see on Amazon. The author and illustrator, James Prosek, is often called ‘the Audubon of the fishing world’ and has written and illustrated several books on fish, fishing, and life in general(including a newly released book on ocean fish illustrations – each painting is accompanied with Prosek’s individual experiences with that fish). Click here for the James Prosek page on Amazon. I hope everyone had a wonderful Thanksgiving, and enjoy the last week of November! Orange...my favorite color! Loved this post and the beautiful pics. Every picture is stunning, Holly! Thanks for sharing these beautiful images! I love your coffee table and rug! So pretty! I love orange as well and I agree that it is too early to decorate for Christmas yet! However…we have already begun simply to simplify things! We will be out of town all next weekend and I knew this would really help my husband out! Having had Christmas out in my shop for a while now I am really hoping I can stay in a good mood throughout December! Oh, and my son is home this weekend so it's been fun for him to see a little bit of Christmas! Enjoy the rest of November and again, I loved all of your pictures! Great book recommendations as well…we carry several in the shop! Oh yes. Neutral rooms are made for pops of orange, pops of warm. I find it interesting that you don't like red, and yet you love orange! They are both so bold and so intense, but in the end, different. I fill the house with orange roses every Christmas. And just yesterday bought an extravagantly orange coat that I simply love! Love seeing a snippet of your room (more please!!!!). My Dad fished for trout and salmon in the river right out in front of our house my whole life, so this book reminds me of him! love the rothko and floral combo you created. stunning collection of this fresh color. I hate red too! Lovely images. We are waiting until next weekend to decorate for Christmas. It seems much more appropriate to decorate in the month of December. oh my goodness what a beautiful post, I haven't seen orange peonies before! Magnificent! Holly The very first time I saw a ranuncula I was enthralled by the beauty of its swirls of petals! Orange is one of my favorite colors, and these photos are beautiful! I too am having a difficult time switching over to Christmas decor. I feel like I spent so much time getting the house ready for Thanksgiving! We are so excited to see our space on your blog! Thanks for the mention and we always love some orange! I am so glad to see this post. Autumn is my favorite time of year, and I love to have it last as long as possible.I miss the days when Christmas decorations did not appear before Halloween and we had never heard of Black Friday or Cyber Monday. Your photos show a respect for the season as well as a reminder that autumn still exists in all it's glory. Smart to put the blog url link for your email subscribers. I recently started a blog and some blog reading virgins don't get that you have to enter the site to subscribe, comment, etc. Beautiful images. The arrangement with the oranges is my fave too. I have never seen orange peonies in person. Have you? The last is my favorite because they look more red to me (my favorite color). I'm not positive whether this put up is written by way of him as nobody else understand such special approximately my problem. You're amazing! What amazing photos you're sharing! They're so vivid and beautiful. I've never seen orange peonies. Lovely! It's in fact very difficult in this active life to listen news on Television, so I only use web for that purpose, and take the hottest news. I wanted to thank you for this great read !! I definitely enjoying every little bit of it I have you bookmarked to check out new stuff you post.